On Christmas eve, I posted an article exploring the idea that 2015 might be a make-or-break season for Manny Banuelos as far as his tenure with the New York Yankees was concerned. 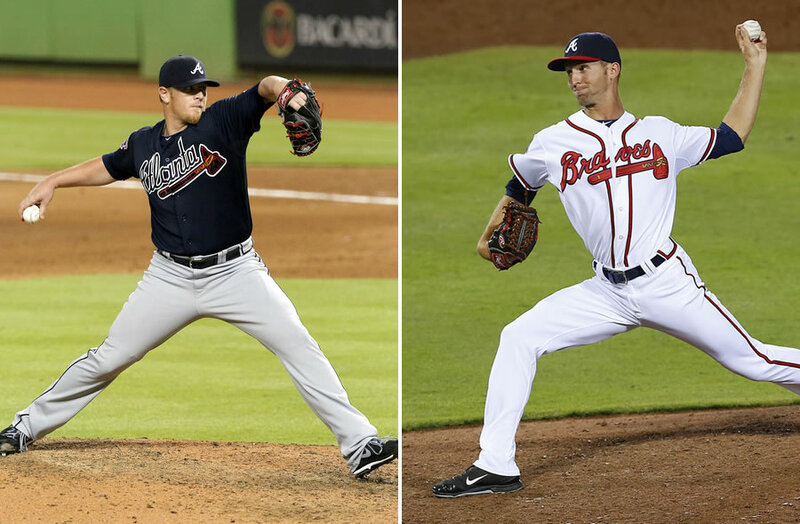 Yesterday evening, the Yankees made the decision for him, essentially giving up on their once top prospect and trading him to the Atlanta Braves for relievers David Carpenter (above, left) and Chasen Shreve (above, right). How do I feel about this trade? I’m still not sure, so let’s talk about this pretty big news a little more. First of all, let’s take a deep breath and process the fact that Banuelos is no longer in our organization. Just a few years ago, Manny was considered the team’s best prospect, making a huge splash in Spring Training that had fans and media buzzing and wondering if he’d make the rotation straight out of AA Trenton. He didn’t, and then injuries derailed his next two seasons. Although he finally returned healthy in 2014, he did not perform to the high standards he had set for himself before the missed time. I was completely blown away when I first saw that the deal had gone down. How could they trade Manny Banuelos? Our best pitching prospect! Our future #1! The next great Yankees lefty! Then I realized… We’re not talking about the 20 year old Manny Banuelos anymore. We’re talking about the 23 year old Manny. The one with a bum elbow and all sorts of other issues. It’s pretty evident that Yankees no longer see him as a sure thing, and they thought it would be more worth their while to trade him for some players they know can help in the immediate future. How the mighty have fallen, eh? As I said earlier, the Yankees received two relievers in this deal: right-hander David Carpenter and left-hander Chasen Shreve. Carpenter is a 29 year old from Morgantown, WV, upon whom the braves have relied pretty heavily the last two seasons. They picked him up off the waiver wire from the Red Sox (he bounced around a bit throughout his early career) in 2013 and, after joining the club, he went 10-5 with 2.63 ERA, and a very respectable 2.88 FIP in 126.2 innings over two full seasons. When you throw in his 10.0 K/9 and 2.6 BB/9 averages, you start to see just why he might be of great help to the Yankees this season. He features a mid-90s fastball and a mid-80s slider, both of which should help him step right into the role formerly filled by the departed Shawn Kelley, but with two extra years of team control. Apparently, he also came highly recommended by Brian McCann, who caught Carpenter in 2013. Check out some video below. Shreve is just 24 years old, and has a much shorter track record than Carpenter. The lefty from Las Vegas just made his Major League debut last season, having been called up briefly in July and then for good in September when rosters expanded. With the Braves, he ended up pitching in 15 games, striking out 15 batters and walking only 3 in 12.1 innings with a 0.73 ERA and a 1.43 FIP. In the minors, he put up similar big K, small BB numbers. His fastball sits in the low 90s, but he was clocked as high as 95 last spring, so he can bring it a little bit too. His slider and changeup made him as effective against lefties as he was against righties in both the Majors ad Minors last season, which could make him a very intriguing guy to have around. Also, his name is Chasen. The Yankees pretty much have the market cornered on guys named Chase already, so this is the next logical step. Anyway, Shreve has two Minor League options left, so he’ll be battling with everybody and their mother (the Yankees have a pretty impressive crop of young relievers in the mix) to see if he can nab the final bullpen spot this Spring Training. Watch his first Major League K below. So… That’s the trade. It’s really still a tough one to wrap my head around. I keep telling myself to not think of the Manny Banuelos we knew and loved in 2011, but rather of the Banny Manuelos that made us oh so nervous, scared and frustrated over the last three seasons. What we must really think about, is whether the hope that Manny would finally take that next step in his career and contribute at the Major League level as we always thought he would, is worth more than further solidifying one of the best bullpens in all of baseball with a guy we’ll have for at least three years and a kid who, despite very little hoopla, actually has more MLB experience than does Banuelos. It’s a tough call, but I have to believe that the Yankees would not have given up on Banuelos if they didn’t have reason to. He was no longer a top prospect, and now he’s no longer a Yankee. Goodbye, Manny. Goodbye, Banny. We’ll miss you both. Happy 2015, everybody!